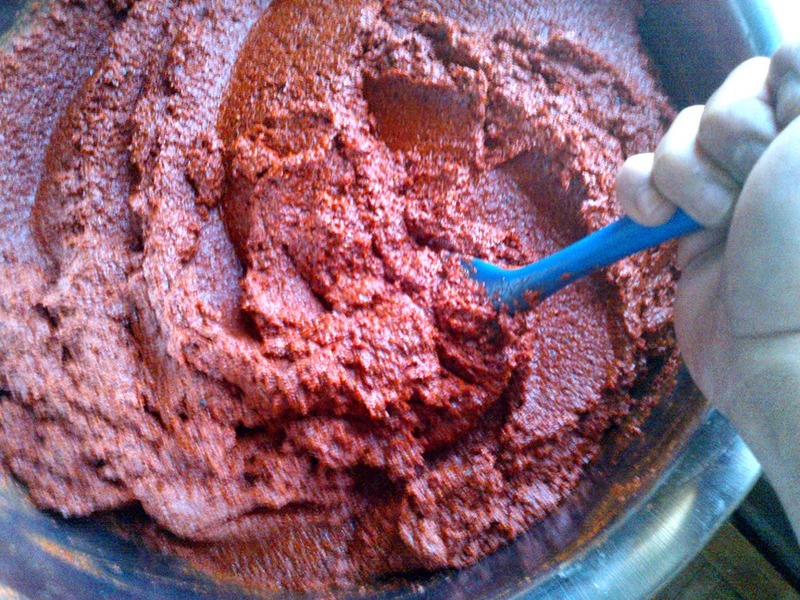 Cellphone action shot, vigorously mixing Korean chili paste—this will rest for a few hours to allow the flavor to bloom. Now this is a thing of beauty—a healthy, fresh tub of vegan Korean chili paste (gochuchang) with aspects of the land and sea. Gochuchang is the building block of all Korean food matter. Instead of fish sauce I use a combination of kelp, seaweed and mushrooms to pack this umami bomb; my house-made chickpea miso ignites the fuse. Traditional kimchee by nature is NOT a vegan food, some varieties use marrow or beef stock as dictated by the food philosophy of yin and yang. Organic miso is the yang in my gochuchang; it’s rich in glutamic acid, which gives it a flavor profile that’s comparable to sun dried tomatoes, Parmigiano-Reggiano cheese or cured meats. I’m fortunate to know nutritionists and pathologists (all with varying opinions) who have called the importance of vitamin B12 to my attention. I’m not a vegan, but my kimchee is—all due to an allergy I’ve developed to shellfish. Traditional kimchee (kimchi, gim chi, 김치) is a good source of vitamin B12 solely by the fact that it’s made with fish-based sauces. Vitamin B12 (also known as cobalamin) is synthesized from bacteria and made available through animal food sources (fish, eggs, meat) but this is only made possible by an animal consuming food with the active bacteria. Plant-based foods by nature have none unless they are grown with animal-based fertilizers or fortified. My organic miso is a key ingredient in my vegan Korean chili paste and kimchee mostly for it’s unique flavor but also to include trace amounts of essential minerals. Whether it is a reliable source of B12 is debatable. I wouldn’t consider kimchee to be a complete food but it’s rich in probiotics and nutrients; it is a good source of vitamin K, which allows for calcium absorption from vegetables. None the less, traditionally made soy foods along with other preserved foods have sustained Asians through the leanest and most desperate of times, in part it is in the way the soy crops are naturally fertilized and grown. Our modern food culture continually removes us from the way food was grown. Most commercial vegetable crops are chemically grown and engineered to increase production. Isn’t that borrowing from Peter to feed Paul? My grandfather would get chicken manure from the poultry farm to fertilize his garden. That was one bumpy, scary ride in an open pickup truck but we always had great produce—tomatoes, eggplants, peppers, squash, pumpkin, sweet potato, purple yam. I also recall that in my mother’s village that when rice farmers flood the paddies, they also raised tilapia and fed them with chicken manure. This is the ingenuity of the waste-not-want-not culture... but to this day I still have a problem eating tilapia knowing what I do. Here’s some food for thought. Bodily requirements of B12 are very low; as adults we need twice the daily (2.8 ng) amount than we did in our teenage years (1.4 ng). This water soluble substance is essential to maintaining our brain functions, nervous system, blood production and generation of new cells. A deficiency will eventually lead to anemia and neurological deterioration; symptoms of overdose are are only due to taking too many supplements, but you have to try real hard to do that. I have since re-encountered some of the most radical New York macrobiotic vegans that I knew from the early ‘80s. All of them no longer engage in this food philosophy; some are vegetarians and some just don’t include red meat in their diet. Notably all of them look better now than when they were in their early 20s. I’m not a food scientist, but I feel it’s important to consider nutritional wisdom when choosing a vegan lifestyle. Here’s more in-depth information about vitamin B12 from the US Office of Dietary Supplements Health Professional– National Institute of Health.